Our bestseller—now better than ever! Enhancements to our regal replica of an antique corkscrew promise years of effort-free openings. A smooth-gliding, Non Stick coated worm removes corks (natural and synthetic) with a simple pull of the handle. Inner workings and grapevine-relief casing made of lasting zinc alloy. Antique Pewter finish. Can also mount to your bar. 2nd one broke quicker than the 1st..
We owned an Estate opener for almost 10 years with frequent use as we entertain often. As it was looking old, we replaced with the Legacy. After 10 months, the handle broke off. Wine Enthusiast was good enough to replace, but after less than 9 months, it has frozen and totally useless. Worst product bought so far from Wine Enthusiast. Hard to use...hard to get cork out once opened. Hard to hold bottle in place with only one hand. Sorry I bought this product. Our first one broke after 12 bottles. I did open a bottle with a composite cork and I think those are hard on the device. I notice that now there is a warning against using them with composite corks. I ordered Antique Peuter and received Antique Bronze. I assume the Legacy will perform as expected. Have used this item at friends' homes - was impressed. Bought my own, after 2nd. time it just wasn't working. But my bar looks nice with it on it!! This was purchased as a gift and is the second purchase with WE in the past month. In both cases the packaging was wrecked. WineEnthusiast needs to care more about the condition with which they are sending their customer's orders! I bought this for my Mother-in-Law for Christmas and I'm almost embarrassed to give it to her. The packaging/box it came in is so beat up... it looks like I bought it at a garage sale. This opener worked but a few months before the corkscrew bent. I replaced it for $17 and it never performed well again. It's frustrating and I am deadly disappointed in this product. Beautiful but did not work properly. Unfortunately as good as this unit looks, it did not work properly in that it would not fully remove the cork from the wine bottle. This was a gift and was surprised when I got a call from my son stating that it did not work. Tried it myself and had the same results. I contacted WE Customer Service and Cynthia could not have been more helpful and/or responsive. Since they do not have a service center, WE did not want the unit returned & issued full credit. Purchased this as Christmas present. First one did not work and was immediately replaced which was appreciated. Unfortunately the replacement did not work either. Very disappointed. All good. Fast and Easy to operate. I have owned a few of these over the years. However, this is the first one I bought that works poorly. After removing the cork from the bottle, the lever hangs up putting it back into the original position, which also removes the cork from the corkscrew. It is even easy to bust your knuckles with this one if not careful. Not sure what happened, but the quality of this one is much lower than the others I have owned. the action is very short so that the cork does not come all the way out. If your hand slips on the grip, the bottle can fall on the floor. The cork never comes completely out on the first pull. It is always necessary to re-grip the bottle two or even three times for the cork to be removed. This means lowering the bottle in the gripping mechanism, which causes great concern that the bottle may not be gripped enough and could fall. I've tried lowering the bottle in the grip for the first try, but the cork does not come completely out then either. Looks great, but does not work so well. Bought this because it looked pretty cool and seemed functional. Use this maybe 2-3 times a week. Loved it for the first few months, then the cork worm bent and it was not functional. Bought a replacement worm, worked for a few more months, then the worm bent again - once agin, not functional. Looks great, not user friendly. I ordered this opener on line as a gift for Christmas. Within a day I began receiving marketing e-mails from Wine Enthusiast. I wouldn't complain about one or even two marketing e-mails, but I received several a day for several days until I finally found the hidden 'unsubscribe' button. These marketing stooges are so aggressive and careless of your privacy. This will be my last stop on this site. This was the perfect gift for my sister and brother in law. They frequently entertain large groups, as well as enjoy quiet time together after hectic days at work. This pretty, but practical wine opener is a great conversation piece. It gets those bottles opened fast so wine can be enjoyed sooner! This is a beautiful piece! My guests enjoy using it as well! I only have two minor complaints...it did not come with instructions on how to remove the cork from the screw at the end...I eventually figured it out but not until after my party! Also, the rubber protective "feet" are too thin and flimsy, I replaced them with better ones. Love it! would give it as a gift! It makes opening wine so much more easy! Great product, 3rd one I have bought. Bought this 3rd one as a gift. Still have mine. This is a great addition to the bar at home. It has a classic look and is very functional for entertaining. Was a Christmas gift I gave to my husband. He loves it. Very easy to use. Was a reasonable price. I have seen it more expensive almost double the price. Looks impressive: works even better! Instantly gets noticed when guests see my bar. 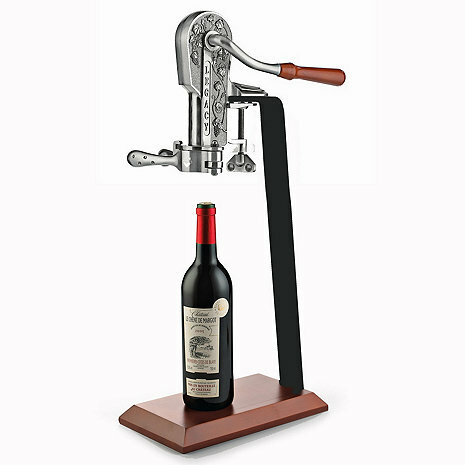 The smooth action of the lever coupled with the fact that the bottle is held in place by the lever clamps, make this very easy for my "old hands" to open wine bottles totally effortlessly. A pleasure to use as well as asthetically pleasing to look at. A great conversation piece as well! Love it... very useful ! I have one myself, so I bought two for Christmas gifts. This Corkscrew with stand exceeded my expectations. It is built a lot better than I expected. It is durable and its appearance fits right in with our other bar accessories. I received this as a wedding present 10 years ago and since have given it as a gift to every wedding I attend. Love this and use it daily, all as advertised and works very well. I already had one of these and enjoyed using it so much! I actually bought this one as a house warming gift for a close friend who bought mine as a birthday gift a couple of years ago. His old home had a wine cellar and so does his new home but I knew he did not have one and had purchased a few of them as business gifts for his high value clients who were fellow oenophiles, but never got one for himself!?? This is a great quality corkscrew at a very reasonable price. My only complaint was the birch stand showed as birch colored and when it came it was more cherry in color. Delivery method and timing was not clear when on-line order placed as a Christmas gift. It took two weeks to arrive (after Xmas). Great opener, but check the color! This is a nice addition to our bar and has already been put to much use, although it is a good thing I am handy with wood refinishing so I could restain and refinish the birch stand. Our stand was not as advertised, lighter stain than pictures. Difficult to assemble stand to base - holes in stand did not match up with holes in base. Also, rusty screws were provided. Considering that the bottom portion of this is so drab and ugly, I feel it is over priced. Just got it and so far it works great! Much better than cheaper models. The proof will be the length of service. It was very easy to put together and came undamaged. I purchased this as a gift for my wife. Since she's received it her girls night parties are that much better as all the other ladies insist on bringing a corked bottle of wine just so they can have the experience of using the opener. The corkscrew was great until one of the lever clamps broke. If you can't get a replacement lever, then all you have is a fancy paperweight. looks good as a decoration but difficult to use to open bottles. Worked great for a couple of months. Then one pull turned into 3,4,5 tries and sometimes more. Could not find any solutions on line or a replacement corkscrew. Now i use something else. THIS THING IS DIFFICULT TO WORK, ENGAGES TO THE SIDE OF THE CORK DAMAGING IT THEN UNCORKS ONLY 1/3 OF THE WAY LEAVING ME TO GET THE BOTTLE OFF OF IT AND TRY TO REMOVE THE DAMAGED CORK. I HAVE QUIT USING IT. The base is too light weight. Takes two people to keep it down and uncork the bottle. The uncorker part is also not strong enough or something. Ordered another brand and it works beautifully. This particular one is disappointing. Second one I have owned and now it's a decoration. There's a plastic bushing inside the mechanism. If it breaks, you have to find the part. I'm making a lamp out of this thing - LOL. Don't waste your money on this. I now have the chargeable one and it works perfectly.